If you want to use your gifts to help the country, you might consider giving to iVoter Guide. You may also want to check them out if you are having trouble figuring out what the candidates stand for. This is a God-focused non-profit organization that helps to gather information about candidates so that you can make more informed decisions when you vote. There have been many great voter guides over the years. 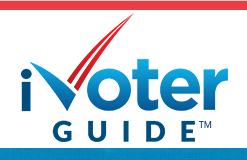 It may be a good idea to use more than one if you can, but iVoter Guide is growing to become one of the stronger choices as other guides have decided to encourage their readers to check out iVoter Guide. iVoter Guide uses your zip code to help you out with close races. They compare the candidates based on how they answer questions. They also keep track of candidates’ campaign promises to see if they are following through. Having the data in one place makes it so much easier to make a decision. iVoter Guide is intentionally “Grounded in God” and “Grounded in Research” but they clearly want to provide information to you so that you can make your own choice. They don’t intend to tell you how to vote, rather they want to make the data obvious so that your choice is well informed.